This must be some kind of joke, because the pure silliness of this disc is just too much. Thor, the Canadian performance artist, bodybuilder, B-movie actor, and part-time metal frontman, has released his newest project, an album that makes Spinal Tap look like Led Zeppelin. 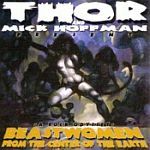 Containing all of the charm of a public access television program, and a bloated sense of self-importance to boot, Beastwomen from the Center of the Earth isn't just the title to this campy, cheesy rock orchestra; it's the title of a bad nightmare that went 12-tracks deep and is nearly inescapable. Unless you have a high tolerance for the lowbrow, or really dig bands like Manowar and The Rocky Horror Picture Show, this one's a big dud.